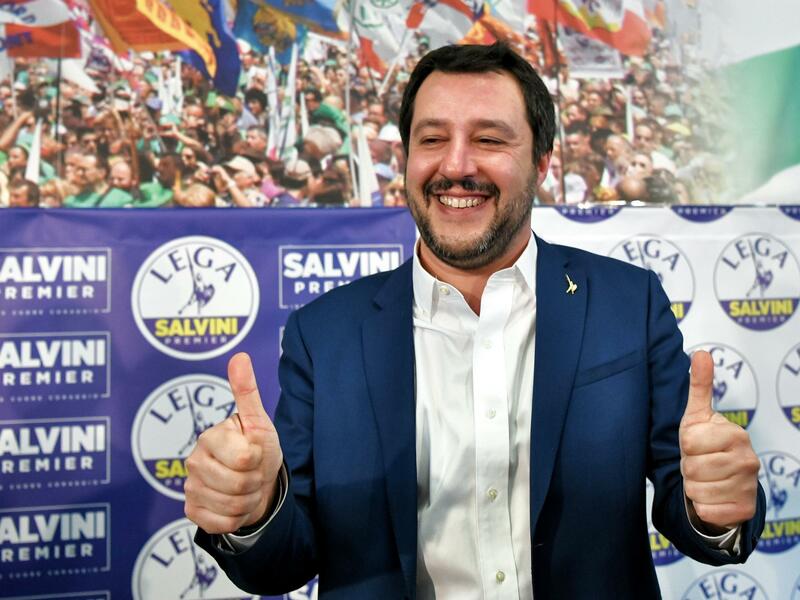 Italian far-right League party leader Matteo Salvini gives the thumbs-up in Milan on Monday. Salvini said his right-wing coalition had the "right and the duty" to form a government after taking 37 percent of the vote in the weekend election. Italy's populist 5-Star Movement leader Luigi Di Maio (center) is surrounded by bodyguards as he arrives to give a press conference on Monday in Rome. The Italian political world has been struck by a populist tsunami — 50 percent of voters in Sunday's parliamentary elections chose candidates from anti-establishment, anti-immigrant and euroskeptic parties. However, no party amassed enough votes to form a government on its own, and this makes weeks of political instability likely while government negotiations are underway. "Italy ungovernable," read a Monday headline in the daily La Stampa. The Italian populist parties' success is the worst blow to the European Union since British voters chose to leave the EU two years ago. The 5-Star Movement tripled its number of members of Parliament and became the single biggest party, with 31 percent of the vote. Despite a poor record in municipal governments in Rome and other cities, 5-Star swept the entire south of the country and large parts of the center. It was able to tap into widespread anger over Italy's sluggish economy, high jobless rate — especially among the young — a surge in migrant arrivals, and resentment about loss of sovereignty to the European Union. The far-right League, which ran a virulently anti-immigrant, fear-mongering campaign with overtly racist slogans, scored across northern Italy. It ran as part of a center-right coalition but stunned analysts by surpassing its coalition partner, the Forza party run by former Prime Minister Silvio Berlusconi. The League won 18 percent of votes cast, while Berlusconi's party fell to under 14 percent. This has turned the League into the de facto leader of the center-right coalition, which scored a total 37 percent, just short of the 40 percent needed to form a government. 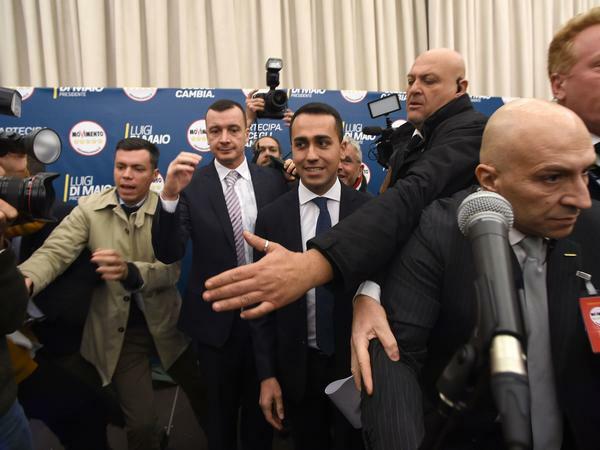 League leader Matteo Salvini was jubilant when he appeared before reporters Monday morning. "I am proud to call myself a populist," he said. He claimed his party's strong showing gave him the "right and duty" to run the next government. An hour later, 5-Star leader Luigi Di Maio made the same claim for his party. "We are a political force that represents the entire nation," he declared. "We represent the entire boot, from Val d'Aosta to Sicily." Should the two parties end up governing — either jointly or on their own — that could have a negative impact on Italy's traditional pro-Atlantic alliance stance and its relations with the United States. Both parties have little interest in a united Europe — the League's slogan is "Italians First" — and both are pro-Russia, calling for an end to economic sanctions. Both have praised Russian President Vladimir Putin. In the past, both parties had also called for a referendum on whether Italy should remain in the single-currency eurozone — although they backtracked on that during the campaign. On Monday, the League's Salvini said that "the euro was a mistake" and has proposed renegotiating Italy's many intricate treaties with the EU. Italy's center-left coalition is the big loser after Sunday's election. The Democratic Party, which has run the government since 2013, came in at less than 20 percent, its lowest showing ever. Italy's economy has improved in recent years, but the Democrats paid the price for a still-sluggish recovery and the migrant influx. French far-right leader Marine Le Pen, a runner-up in last year's French presidential election and a strong critic of the European Union, welcomed Italy's election result, tweeting, "The spectacular advance and top showing of the League coalition led by our ally and friend Matteo Salvini is a new stage in the awakening of the people!" European governments, meanwhile, reacted cautiously. Along with France, both Germany and the Netherlands managed to push back major wins by their own populists in elections last year. As they digest Sunday's results, Italy's EU partners will have some soul-searching to do about having left Italy on its own to handle an influx of hundreds of thousands of migrants, and imposing draconian austerity measures that stymied the country's economic growth. French President Emmanuel Macron said he was "cautious at this stage" about the election results, but acknowledged Italy had been under "heavy migratory pressure" for a long time. The League blames the arrival of more than 600,000 migrants in the last four years on the outgoing center-left government. It campaigned on the promise of mass deportations of immigrants, and one of its slogans was "I want back the Italy my grandparents left me." The 5-Star Movement wants the immediate repatriation of tens of thousands of migrants — which cannot be done without repatriation deals with the countries of origin, of which today there are very few. 5-Star's campaign promises included a so-called "citizen's income," which would give Italians below the poverty line as much as 780 euros ($960) a month. And it wants to lower the retirement age for pensioners. Should either party — or both — end up governing, analysts say they are likely to increase government spending, which would only add to Italy's massive public debt, already at 130 percent of GDP. On Monday, Italy's stock market was down, while trading on global markets was higher. Italy's shares and bonds were weakened following news of the election results, as was the euro. It will be weeks before the political outcome of the elections is clear. First, the new parliament will be seated and it will elect Senate and House speakers. Italian President Sergio Mattarella will entrust someone with the task of trying to form a coalition. That could be the League's Salvini, as leader of the biggest coalition. Or it could be 5-Star's Di Maio, as leader of the single biggest party. The problem, however, is that 5-Star has always rejected the notion of power-sharing. Perhaps that will change in coming weeks. If no one can form a government, it's possible that another election will be held in the coming months. But that would not likely stop the populist wave. A sign of what is at stake in Italy was the presence in Rome over the weekend of Steve Bannon, President Trump's former chief strategist. Before the vote, he was quoted in the New York Times as saying that Italy's election "epitomizes everything, it is pure populism... The Italian people have gone farther, in a shorter period of time, than the British did for Brexit and the Americans did for Trump ... Italy is the leader." "Oh yes," said one dejected voter in Rome. "Italy is always ahead of the others. We created fascism, we had the biggest communist party in the West, and now our populists are taking over."